So, I’ve already talked about how to look after your skin on a plane. Next I thought I should talk about the things I like to bring on the actual vacation/competition/whatever reason I’m travelling. This time I’ll be away for almost two weeks, so keep that in mind. 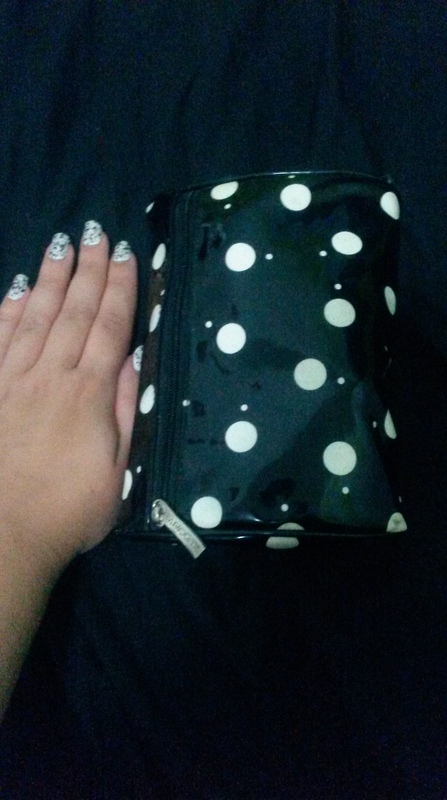 Here’s the size of my makeup bag with my hand for comparison. It’s a latex/plastic bag which minimises the risk of products leaking and ruining whatever else is in my luggage. I don’t put my makeup in my carry on beyond a foundation and a lip balm. If I end up loosing my luggage, then I’ll still have the basic things I need. It’s on the smaller side compared to what I’ve seen most of my friends bring but I still feel I can bring more stuff than I’ll end up using. Nor have I needed to limit myself to just one look. Please note that this doesn’t contain everything. I keep toiletries separate, so you won’t see my shampoo and conditioner, makeup wipes, toner, or other skincare items in here (not to mention toothbrush, toothpaste, and hairbrush/comb). I’ll probably talk about that in my generic packing post. And as noted above, my foundation won’t go in here. So what does this mysterious bag actually contain? In addition to my makeup, I’ve also packed basic stuff like a few bandaid s for blisters, some of those flossy things (very scientific name), tweezers, nail clippers, hair ties, bobby pins, and some cotton pads. There’s also something I don’t usually bring but decided to use this time, and that’s the gel pads that you put somewhere cold and then put on your eyes. I just find them really nice to use when I’m tired after the flight. Makeup: CC cream (palmers), papaw ointment, translucent powder that’s meant to keep your skin from getting oily. One mascara, one eyeshadow palette, one lipliner, one lipstick. (I’ve since moved the lip balm to my carry on after realising I don’t need 2 balms and the papaw ointment). Two eyeshadow brushes. 3-4 pencil eyeliners and one gel eyeliner. This is after I decided to throw some extra things in, I usually limit myself to one or two eyeliners. I’ll probably add some pain killers in here too and maybe even some nasal spray to make it a miniature medical kit.